Today’s addition to the Halloween Horror series is from game designer Preston DuBose (Bloodlines) from 12 to Midnight. Artist Jeff Preston adds a bit of colorful dread to this strange creature. From the icy waters off the tip of Alaska to the warm coastal waters of Malaysia, Biting Water tears life from all manner of creatures. Some fishermen call it “witch’s water”, “dead water”, or “stinging water” and attribute it variously to a cursed shipwreck, underwater volcanic activity, witchcraft, jellyfish, invisible sea monsters, and aliens. Biting Water is a patch of ocean water anywhere from 20 to 110 feet in diameter that paralyzes its prey before painfully grinding flesh from bone. Reports from those brave or foolish enough to investigate suggest that Biting Water is the same color and temperature as the surrounding ocean. Biting Water allows its prey to enter deeply into its midst before striking, the better to insure the prey’s capture. A swimmer’s first warning is a sharp, stinging pain very much like a bite or having one’s flesh pinched between sharp fingernails. The attack leaves a quarter-sized, bloody pockmark on the skin. Experienced locals know to immediately swim in a straight line as far and fast as possible. Skeptics and strangers frequently react by stopping to examine the bite and look for its source. As they are still examining the first bite and feeling numbness burn around its edges, Biting Water begins to chew. In most victims, mild alarm turns into fear and panic. Panic drives the heart faster, which pushes the Biting Water’s paralyzing salts through the blood stream and into muscle. As the prey loses fine motor control, swimming devolves into thrashing toward safety. The victim’s muscles painfully cramp and spasm, while blood blossoms in the water from dozens of small, deep wounds. 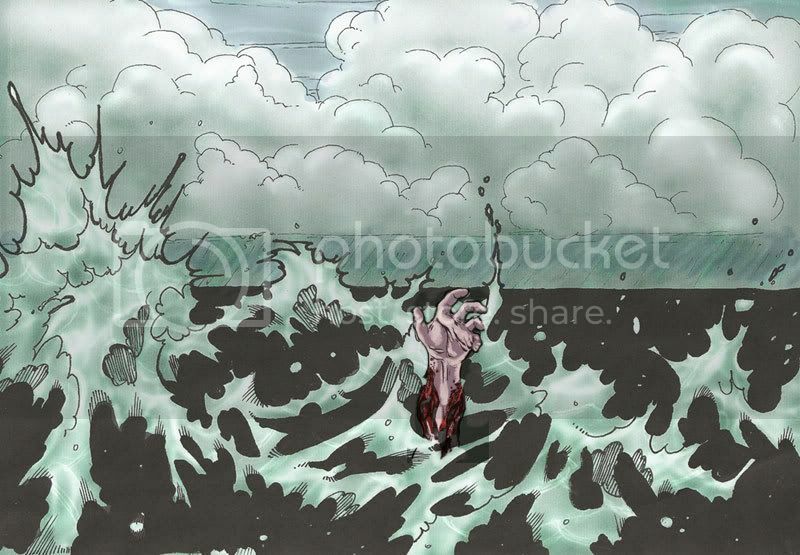 As the victim loses gross motor control, he claws at the ocean and empties his lungs in screams for help. Below the surface, the biting becomes grinding. The ocean is seemingly as hard as a millstone, rubbing the flesh from his body as easily as a t-shirt-clad biker smearing down 60 feet of asphalt. Empty lungs quickly fill with water as he slips below the surface. The surest way of finding Biting Water is to look for the bones littering the ocean floor. Preston P. DuBose is president of 12 to Midnight, a publisher of modern horror roleplaying games. He has several RPG writing credits to his name and hopes to begin adding fiction credits to the list as well. He keeps a semi-regular blog and can be found in various social media, where he invites you to “friend” him any time. He lives in Texas with his wife and kids. Jeff Preston is a Freelance Illustrator who has been doing concept art and quality interior art and a few covers since the early 21st century. Jeff has been producing art under deadlines consistently, building a reputation as the go-to guy for artwork to order, with no guff, and always on-time! Visit www.team-preston.com for a look at his gallery and upcoming projects.